A lot of Marvel Comic covers in the 1970's were fun and colorful and this cover is no exception to that. 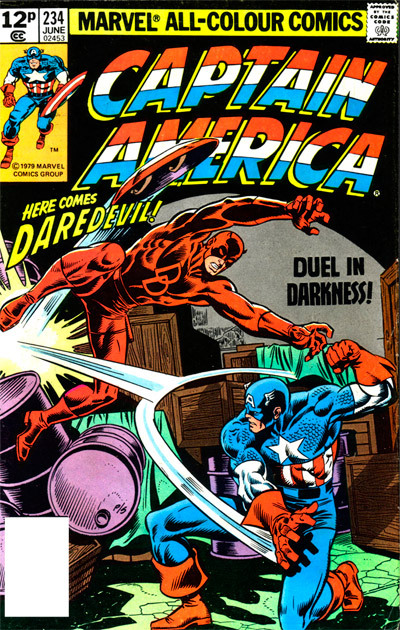 You have two icons on the cover facing off but why are Daredevil and Captain America about to fight? It seems Captain America is brain washed and joins race rioters in Harlem spouting racist remarks! Say what? It seems a white supremecy group called National Force is behind it and they even place a swatstika on the front of his shield! Matt Murdock arrives to investigate Cap's strange behavior and intervenes eventually snapping the super soldier out of it and returning him his true self! Heavy material back then and even now for a super hero to face!